Freewheels are the ratcheting cog device on the rear wheel. The freewheel threads Onto the aluminum hub shell on the rear wheel. There two common thread patterns on rear hubs for freewheels, English thread, (used by just about everyone), which is a 1.370" outer diameter with 24 threads to the inch, and the Italian thread (used by a few makers under a few circumstances), which is 35mm in outer diameter with 24 threads to the inch. We stock freewheels only with the English threads. In many cases, freewheels are no longer used on bikes. 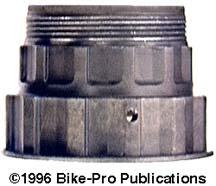 Bicycle parts makers realized that the minimum tooth size of a first position cog on a freewheel could only be 12 teeth. They then turned to the idea of incorporating the freewheel mechanism into the rear hub itself, with a set of sprockets sliding onto it. This style of hub has become known as a freehub. By incorporating the freewheel mechanism in the rear hub makers were able to reduce the overall weight and increase the width of the weight placement on the rear axle providing better load distribution and support. Cogs in a freewheel or cassette are said to have a "position". The position is it's placement in the rank or set of cogs starting with the smallest of the set. The smallest is the "first" position, the second smallest is the "second" position, and so on out through the 6, 7 or 8 of them. Small cogs are also said to have a "lower" position, while large rear cogs are said to have an "upper" position. Freewheels have what is referred to as a "body". The body is the core unit of the freewheel that the cogs slide onto and are fixed to. The body itself is what's threaded onto the rear hub, and it provides the internal ratcheting mechanism that makes the freewheel lock, and drive when pulled forward (clockwise), or "freewheel" (rotate rearward without hinderance), when there is no pull from the drive chain. In the freehub/cassette version, this part is called the "freehub body" and it's bolted to the exterior of the freehub hub shell. Both bodies have two main parts, an inner body piece and an outer body piece, generally forged of steel alloy. The outer body piece has an exterior shaped for the cogs to slide onto. The interior of the outer body piece, at both ends, has machined around the circumference, a bearing cup for the ball bearings that carry the load at both ends of the freewheel. The outer body piece, on it's inner side has small steel ramps running around the interior, these are the ratchet ramps to make the device engage in a forward motion only. The inner body piece has it's outer end made with the internal notches that the freewheel tool inserts into, for the F/W removal. It also includes an inner side cone race, and the set of pawls that spring outward to engage the ratchet ramps. 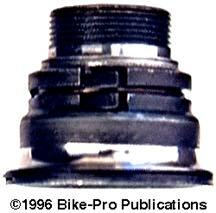 The ratchet and pawls are at the heart of how a freewheel or freehub operate. The pawls are small steel wedges that rotate outward, under spring pressure. When the pawl end comes in contact with the flat face of a ratchet ramp, under load, it pulls the wheel forward. When the wheel revolves without the chain pulling, (it is "freewheeling"), the spring holding the pawl compresses and the pawl runs up the internal ratchet ramp, and moves onto the next internal ramp, which it runs up, until you pull on the chain, when the pawl end engages the flat ramp side, and you are again under power. 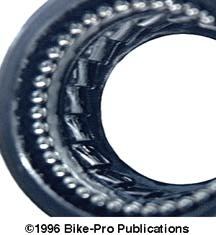 Freewheel bodies use two internal sets of ball bearings to carry the load at both ends. The set of bearings next to the hub shell are called the "inner bearing assembly", those on the chainstay side are referred to as the "outer bearing assembly". There are important dimensional requirements, on both the freewheel and freehub bodies related to how many cogs fit and operate correctly on it. The steel or aluminum cogs are made to a specific thickness, and the space between each of them must be made a specific thickness or width, within certain tolerances. Generally cogs made by all makers are 1.9mm thick. The spacers set between each of the cogs has been standardized at 3.0mm This thickness and spacing width is what all index shifting systems use, which permits the use other makers freewheels to index function, regardless of it being original equipment on your bike. We tell you cog thickness and spacing in the text, so you will see the similarities. Remember that the index function in all shift systems rests largely in the shift lever itself. No discussion of freewheels would be complete without a chat on "Gear Ratio". Gear ratio is determined by the relationship of the number of teeth on the front chain ring to the number of teeth on the rear cog, and then the diameter of the rear wheel. The gears on a bicycle, which are really combinations of chain rings and rear cogs working together, are specified by the number of teeth on each. The gear made of the combination of a 52 tooth front chainring and a 13 tooth rear cog is referred to as 52 by 13 or "52/13" and is written as "52 x 13"
To determine the "gear ratio" , divide the number of teeth on the chain ring by the number of teeth on the rear cog. In the 52 by 13 gear, 52 divided by 13 equals a 4 to 1 ratio. It's easy to visualize, for every complete turn of the pedals, 52 teeth rotate, which pulls 52 links of chain around the chain ring. The same 52 links must also rotate around the 13 tooth rear cog and this requires that the rear wheel must make four complete revolutions, giving us this 4 to 1 ratio. In the thought process of purchasing your freewheel or cassette assembly you may want to calculate each of the gear ratios. You will find that, though nominally you have an "24 speed" bike because it has 24 gear combinations, there won't necessarily be 24 different gear ratios, two or more combinations may overlap, called "gear ratio overlap". Knowing where these overlaps occur could be of help as you map strategies in a race, given the choice of two, in a clutch, you may take the nearest single position, or take a double shift to set up for a necessary single shift in the future. In 1994/5 we will begin to see some of the new roller clutch hubs which incorporate a special clutch in the rear hub rather than the ratchet and pawl. Finally, lubrication. It is recommended that you occasionally flush the freewheel or freehub body with solvent, to wash out contaminants, then re-lubricate with a light oil, or very fine grease, (you don't want to impede the spring and pawl movement with a heavy grease), applied through the opening around the outer cone race, which is the outer most flat surface on the freewheel body. Prior to re-installing a freewheel or freehub body onto a hub you should always grease the threads on the hub, later when you want to remove the F/W it will be much easier.